Sorry, I meant second corral, not wave. The times I ran Boston, 2:52 would have handily got you in the first corral. Do you really think the others in the action sequence look like 2:52ers? I dont. I did find a picture of his brother Kurt. They look similar but not that close. I didn't want to post his picture because he maybe innocent in all this. 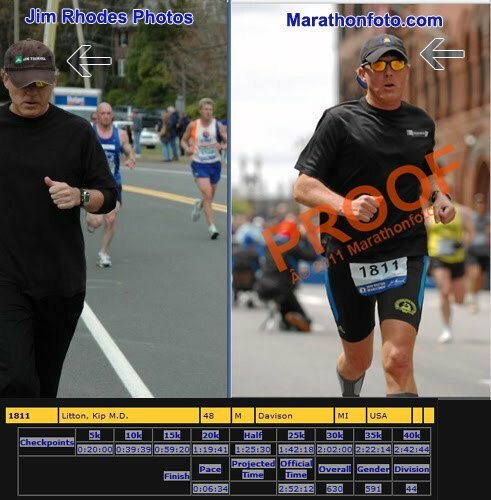 Kurt's profile pic on FB could conceivably be the guy on the right hand side of the photos posted earlier (that compare two runners). They both have small mouths and thin lips and enough of the face is covered up that it could be either Kip or Kurt. It's probably not Kurt, but the possibility is there. can anyone chip in here? It would be interesting to see if someone could replicate these proposed cheating methods. Definitely the bike pacer one. That seems entirely doable especially if the chips are really that sensitive. I have found that the easiest way to break 3 hours is to actually run it, and pace somewhere under 6:52/mile. Crazy, I know. Does anybody remember that episode of Monk where a marathon runner attached his chip to a pace car, ran off course, killed some guy, and got back on the course to finish the race? Maybe that could have been a source of inspiration (minus that whole murder thing). It was pretty slick. Combined, we form a power far greater than any Super Sleuth Monk Detective Crime Fighter Guy. Okay... I'm getting carried away with this. Lastly, about these multiple race weekends he does. The Michelob Ultra Challenge in Tampa, the Whale Challenge in Virginia Beach and that 5k thing in Boston. Most marathoners shy away from those on grounds that they fear it may negatively effect their marathon time. The few that sign up take it as a neat challenge. However Kip sees it and says, "Hot $H!&, I can cheat a several races this weekend!" Someone try this at Boston: Bike along outside the course, stop at each chip mat location, and then at the right time, wander across the chip mat. Maybe pretend you're waiting for a particular runner to come by. Note that some mats are hard to get to, like the start and finish. For those you should be a runner. So you'll need to start the race and go off course later to get the bike. Start with the slow runners so people don't question why you're going off course. Btw you can find a place to lock up the bike and other stuff the day before, after the 5k. When you're in biker mode, be careful that no one sees the chip on your shoe or your bib. Don't look like a runner. Long pants and a long shirt or jacket would help. You might also keep the running shoes with the chip in a backpack and wear a different pair when biking. You can stash running clothes in there too. Just be careful not to mix up the shoes and outfits! Could make for some confusing race photos. In fact you'd be wise to keep your bib partly obscured when running, so there is a reasonable explantion for the low number of photos of you running the course. Let us know how it goes! Jetstream landscape & irrigation....site map....about. These split times from 20-25k still have me baffled. Other runners with similar times take ~4:20 to get from 20-21.1, and ~20:00 to get from 20-25, so 15:40 from 21.1-25. Kip took 5:49 (5:17/k pace) to get from 20-21.1k and 16:48 (to get from 21.1-25 (4:20/k pace). Both of these times are much slower than his overall pace, particularly the first gap. First off, well done for finding that photo. 1) He is one of how many runners wearing long sweat pants? 2) His pants are off at the finish line. So he stopped at some point AFTER 30k and took his pants off and then resumed 6:35 pace? Who does that? 3) His shirt is not the same. Who wears a shirt over another shirt in a marathon and doesn't take it off well before 30k in weather like that? Look at the runners around him. 4) You are talking about 18.6 miles into a marathon and running 6:35 pace and still running in sweat pants. He was not running 6:35 pace at that point. 5) Look at the runners around him. He is NOT running anywhere near 6:35 pace at that point and is being passed over and over. He is shuffling on the shoulder, blending in so runners in the middle don't mistake him for a real runner and remember him. 6) When you run next to the curb, it's easy to act like you are running with someone for encouragement and then bail. 7) Re-enter the same way. Acting like you are waiting for someone and then taking off like you are giving them encouragement. New crowd sees you 200 yards later and you are a runner again. 8) If he could really run that pace, think about this. Why would he not prominently display his race number and want to be seen? 9) I know what the splits show, but it's smoke and mirrors people, that's all it is. 10) His shirt is not tucked over his number, his pants are pulled up over his number. 11) Accomplice or not, car or not, he did not run 2:52 on that day. He looks beat with just less than 8 miles to go. 12) The only other runner not wearing a number, well ahead of runners who obviously would have started in front of him is this guy. Probably means nothing and could be a spectator, but...... If someone else already posted a picture of him, you have my apologies. Look at the gait of the runners around him and look at his. Another phoney. 13) Con, total con. Cannot be legit looking at the guy at 30k, no way. I bet at that point he's running 8 minute pace if not slower. 14) Why is he wearing black? Because the number would probably show through and he would be discovered. Best...thread...ever. When letsrun comes together like this it is a beautiful thing. I would love to know the reason WHY and what kind of mental gymnastics he does to end up thinking it is somehow ok. Bet he never thought anyone would care enough to really look into it, too bad he forgot about LETSRUN!!! Sorry, number 4 and 5 are pretty much the same, but I just got back and another few pages were added so I was typing like a maniac. Sorry again. Click on the link and then page 40 and you will see the guy I am talking about. Pulling a Kip or working with Kip in segments, allegedly possible? You take one I'll take one. Not saying that's what happened, just saying it's another possibility. Agreed, whoever sifted through them all to find that shot, nice job. Also, thanks to whoever linked to this jimrhoades site, fun to look through those shots. Maybe he'd come clean for a price. Maybe the brojos should pay him for an exclusive video interview. As I said about 10 pages ago:):), I am fairly certain RW or another source is going to do a piece on this. It's too intriguing based off his claims, his age, and his profession. Have you, or anyone else, submitted this page to RW or contacted any of their editors? It would be awesome to see this appear in the magazine as a way to dissuade cheaters, because if you cheat, the LR army will catch you!! On this link, I found him on page 21. It is near the finish, but I don't see that it gives us any more clues to anything, because there are three others pics of him from near this same spot. The idea of Kip profiting from this through a book/magazine/interview deal is a little sickening. Totally agree. That can't happen. 2) He registers as a bike volunteer to get all the mats along the course and cross the finish line. After the finish, he gives back the bike, changes, walks back along the course and jumps in the last mile or so to have at least a few pictures taken. Maybe he registers under a fake name or one of his aliases, David Litton or else. Would be nice to get the EXIF data from original pictures, and an approximate location where the photographer stood. So in addition to the splits between the mats we could calculate pace between e.g. mat->photo location->another mat. For some reason I can't pull that particular picture up. I will back off for awhile after this post and let others respond. But remember this little fact. If you think he can break 3 hours in a marathon, why did he cheat and get caught during a damn relay? Seriously. If he can't run one leg of marathon relay without cheating, where's his credibility? To me, he has none. Look at the hat he's wearing in the Jim Rhoads photo. It's the same one he was wearing in the 5k the day before. Definitely Kip. Do the facial features match?